Julia Sweeney: "I Feel Like I've Finally Grown Into Myself"
Julia Sweeney poses for a photo during a visit back to her alma mater, Gonzaga Prep, this week. The comedienne Julia Sweeney is back in her hometown this week. One of her main reasons for coming back to Spokane is to perform her one-woman monologue, “Julia Sweeney: Older and Wider.” That’s Friday evening at the Martin Woldson Theater at the Fox. But she’s also here to visit her mother and see old friends. On Tuesday, she went back to her alma mater, Gonzaga Prep, to talk with students about her career and to teach them about improvisational comedy. Sweeney recently moved back to Los Angeles after 10 years in Chicago. She did some writing, some teaching with the famed Second City improvisational group. After her talk, Sweeney invited eight students up on stage to do a variety of improv exercises. 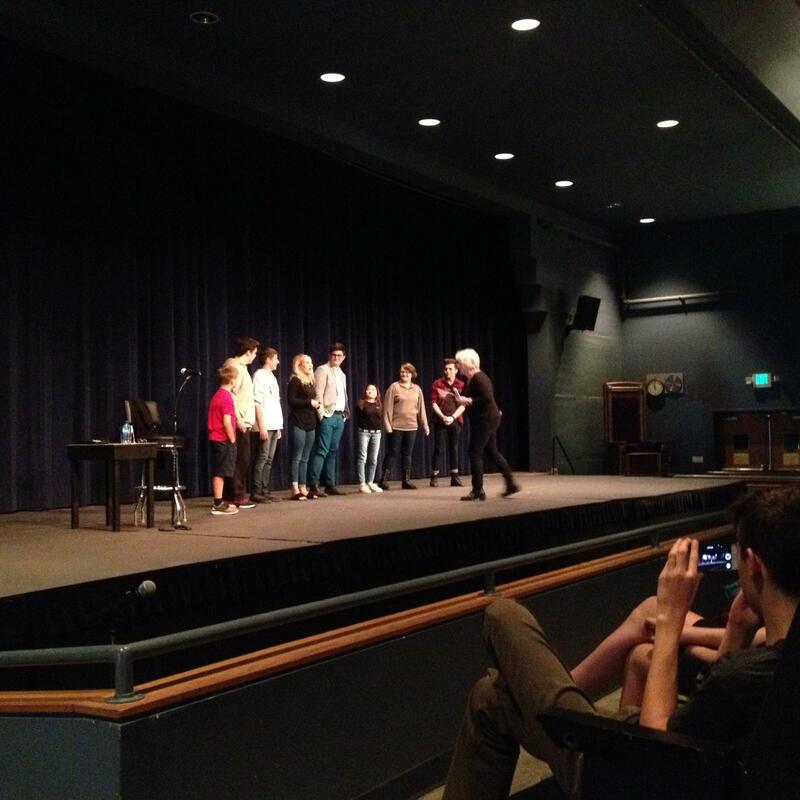 Julia Sweeney teaches Gonzaga Prep students about improvisational comedy. She’s also reveling in being a mother to her daughter Mulan. “Last summer, we went on 14 college tours. I could give the college tours by the end,” Sweeney said. Mulan chose to attend The Ohio State University because of its engineering program. It also is one of America’s great traditional football powerhouses. “We get the application form. We get all the tickets. It says you should buy your football tickets on this day. It doesn’t even say optional. It just says buy football tickets. This makes me crazy. I tell Mulan she does not have to buy football tickets and she says I want to try it out," Sweeney said. "So, for our family, my husband and I, who are not sports people in any way, we’re like, ok, try it out. But we’re pretty confident she’s not going to like it. It’s a world that is fair game for her mother when gets up on stage. Julia Sweeney turns 59 in October and she’s finding a new place for herself in the performing world. “Saturday Night Live” is in her past. Monologues are her main vehicle now. But she’s eyeing new acting opportunities as well. “I do feel like I’ve finally grown into myself. I’m the right look for my personality. I could tell in Wilmette, even before I moved back to L.A., I’m going to be the mom on either a TV show or a comedienne or something like, I won’t be the main character. But I’m going to be a good support character and I’ll probably be a mom. And that’s what happened," she said. "I got on this show, ‘Shrill.’ It’s coming out on Hulu in March and I’m Aidy Bryant’s mom and I’ve already had other inquiries from other big comedians about playing the mom and I feel like this might be my time. I don’t know. We’ll see. I want to work until I’m 80 and then, I swear to God, I’m quitting. If I’m lucky enough to live that long, I would love to work and work. I love it. To me it’s fun,” she said. “Did it help moving back to LA?” she is asked. 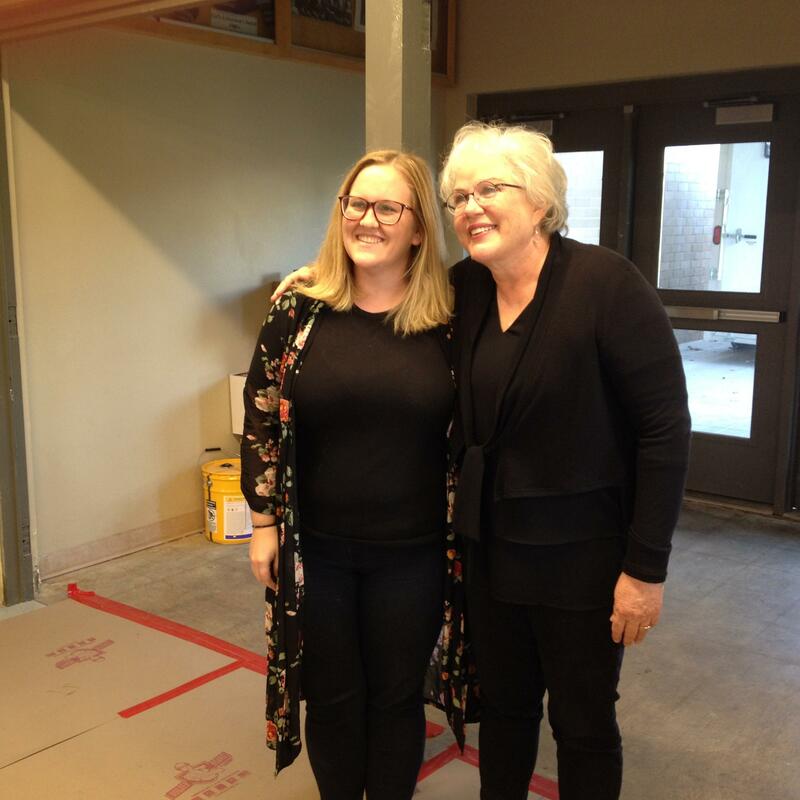 When Julia Sweeney finished her session with the students, she lingered awhile, talking with kids, reveling in the few minutes she had to talk with her old high school drama teacher, posing for pictures. She’s had a few days to immerse herself again in her hometown. “My mom lives here and she has a condo here and I love it and it looks out over the city, so my big relationship with Spokane is looking out from her condo to downtown. And I walk up to Manito Park and I walked over to Marycliff this morning and I walk over to Huckleberry’s and I walked up to 26th and Lincoln, which is where we had our old house that I grew up in," Sweeney said. "I have friends that live here. I’m still close with about eight girlfriends I went all the way through school with. We’re getting together on Thursday night for dinner. So I actually still have a pretty strong relationship with Spokane. Like I could totally live here. My husband wouldn’t live here, he would feel like he would be the only Jew anyone knew." Julia Sweeney’s “Older and Wider” show starts Friday night at 8 at The Fox.